It’s been two weeks since Mom came into the ER. It’s been 11 1/2 days since Mom was put on Comfort Care and we’re still here. We never thought she’d still be with us this long. We were expecting a day or two. Morphine – started at 5 ml/hr, but gradually raised up over time to the current 28 ml/hr (that’s a very, very high dose), helps dilate blood vessels and make it easier for her lungs, and makes sure she doesn’t feel any pain. Ativan – a sedative and anti-anxiety drug helps reduce tremors and seizures. Levsin – pill under tongue to reduce secretions in the throat and respiratory tract. Scopolamine Patch – patch behind ear to reduce respiratory tract secretions. The same type of patch is used frequently for motion sickness. The nursing staff here is just so excellent. We’ve made many new friends here. We can’t thank them enough. Mom’s siblings visited again today. Thank you for your continued prayers and thoughts. Mom is resting comfortably. Her brother Billy and her sisters Regina, Marie and Barbara visited today. It’s now been 9 days since being removed from life support. Mom, Jerry and I just watched the Boston Red Sox win the 2013 World Series!!!! Mom is still with us and resting comfortably. She was removed from life support nine days ago. What a strong fighter she is! We fired her doctor on Wednesday after he did a few things wrong. He lowered her morphine and said we agreed to it, which we never did. Even the nurse was puzzled as Mom was in distress. We immediately brought it back up to the same level and Mom was comfortable again. Additionally, the doctor said that he was getting pressure from “administration” to release the bed and pressured us to move to a hospice setting. He said there was a hospice bed available across the street. The administration told us that was not true at all. They never talked to him about that, and they said we were welcomed to stay through the end. Additionally, the bed across the street is a nursing home, not a hospice bed. We just simply can’t trust him any longer, and relieved him of his duty. We now have a new attending physician. Mom’s brother, Billy, has been driving up from Florida for the past few days. He is the only one of Mom’s siblings who haven’t seen her yet. He will be here within the hour. Mom had an up and down day today. She gets very congested at times. She is resting comfortably now. If you want to receive an email every time we post a new update, enter your email address in the “Subscribe via Email” box on the right side, then press the orange “Subscribe” button. You’ll get an immediate email with a link to confirm your subscription. Mom is currently in the hospital in “comfort care”. I apologize for the length of this post. We intentionally have not posted in a while, and lot has happened in the past week. As described in previous posts, Mom had right hip replacement surgery. She was rehabbing at home and was doing well. As described in previous posts, on Saturday October 12, Mom had a pain in her left side. Dad brought her to the ER and she was admitted to the Progressive Care Unit (PCU). Tests revealed a blot clot in her left leg, probably caused after the surgery. The clot traveled to her lungs and was immediately treated by the a pulmonary. Blood thinners were used to treat the clots, and that caused internal bleeding around the area of her hip surgery’s incision. She was taken off the blood thinners and required two units of blood. She rebounded and was discharged on Wednesday 10/16 on blood thinners and oxygen on an outpatient basis. Mom had a really great, strong Thursday. Alice flew up from Florida and Paul took the train back to Boston. When Mom woke up on Friday October 18th, she walked herself to the bathroom, and when she came out she was sweating and had trouble breathing. During ER1 discharge, they said if you have difficulty breathing, call 911 to come back. So Dad and Alice called 911 while Mom sat at the kitchen counter. The EMT’s came in minutes and Mom got up and sat herself on the wheelchair. When outside, she got up and got herself into the stretcher. She was ok until they got inside the hospital’s ER. While in the ER, she suffered a Pulseless Electrical Activity, or PEA, which is a type of cardiac arrest, where a heart rhythm on the electrocardiogram shows that the heart should be producing a pulse, but is not. They performed CPR for 7 minutes and revived her. She went into cardiac arrest a second time, and they performed CPR for 8 minutes, and again revived her. Defibrillation can not be used to correct a PEA. Alice, Dad and Carolyn were asked to go to the “Quiet Room”. Mom had CT Scan and was moved to the Surgical ICU and put on a ventilator, four types of blood thinners and sedatives. She was unconscious and in extremely critical condition. We were told by the doctors and nurses not to leave the hospital that night. I drove down at arrived at 10pm. Dad, Carolyn, Alice and Jerry were there all day. We slept in the waiting room. Mom was under constant supervision of the SICU nurses. There were many tests performed over Saturday and Sunday and Monday. On Monday, October 21, we met with the ICU doctor, resident and nurse. The multiple neurological tests concluded that the top half of Mom’s brain did not get enough oxygen during the time that her heart was stopped. The doctor said there was so much damage that Mom would never wake again, be cognizant, be able to converse, laugh, make decisions, or make purposeful movements. The lower half of the brain, which controls reflexes, breathing, heart signals, etc was functioning, so she was not technically brain dead, but what makes a person the person they are was permanently and irreversibly damaged. Her kidneys were also shutting down. Mom had advance directives on what she would want if this situation ever happened, and she would not want to live on permanent life support like that. We made a painful, but right, family decision to remove Mom from life support, which is what she wanted us to do. The ventilator was removed and Mom was put onto “comfort care” at 3pm on Monday 10/21. We offered to donate any organs that might be harvested for another person’s benefit. The Gift of Life department was contacted. After reviewing her case they said that they wouldn’t be able to use her organs as they had been damaged too much, but they may possibly be able to use some skin tissue. Note: please consider signing up as an organ donor. Mom was moved from the ICU to the Progressive Care Unit (PCU) at 6am on Tuesday. There’s no way to predict how long someone will last after being removed from life support systems. The main goal of “comfort care” is to make Mom comfortable, pain free and peaceful. 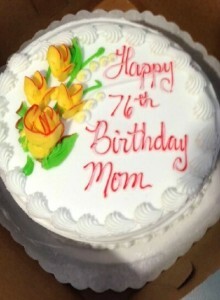 Tuesday, October 22, was Mom’s 76th Birthday. Jerry drove to her favorite bakery, Stocks, and bought a birthday cake. What a touching and wonderful thing to do. Later that night, Dad and us four kids, all stood around Mom and sang a rather pathetic, but unforgettable rendition of Happy Birthday. We were laughing and crying at the same time and we’re sure Mom was laughing with us. We all felt the weight and intensity of the moment lifted afterwards. It’s now been 6 days that Mom’s been on comfort care. Dad and her four kids have been here every day. Two of us stay each night as well. Mom’s siblings in the area have stopped to say their goodbyes. Thank you to everyone who’s given Dad and us support in the past few weeks. We really appreciate your thoughts and prayers. We especially want to thank the absolutely tremendous nurses here at the hospital. They are just great. What a noble profession nursing is! One nurse in the ICU, Melissa, said something after we thanked her for her help that was so comforting and really summed up what nursing is all about – “It is such a privilege to be part of a birth or a death. Thank you for letting me be part of it.” Wow. It’s been an intense week. We didn’t expect Mom to still be with us this many days later, but she’s a real fighter and she’s going on her own terms (which if you know Mom, is kind of her way.) Mom’s resting comfortably now, but we don’t expect her to be with us much longer. We will post more soon. Thank you for keeping Mom in your prayers. Mom is in the ER an in extremely critical condition.